Starbucks opened its biggest store in Korea in downtown Seoul, Wednesday, which is designed to do much more than simply serve coffee. Its former largest in the nation was the “Cheonho Rodeo branch” in Gangdong, Seoul. The 1,097 square-meter compound, named “The Jongno branch,” is located across the street from Bosingak, at Jongno Tower, Jongno-gu, one of the oldest districts in Seoul, dotted with traditional attractions. 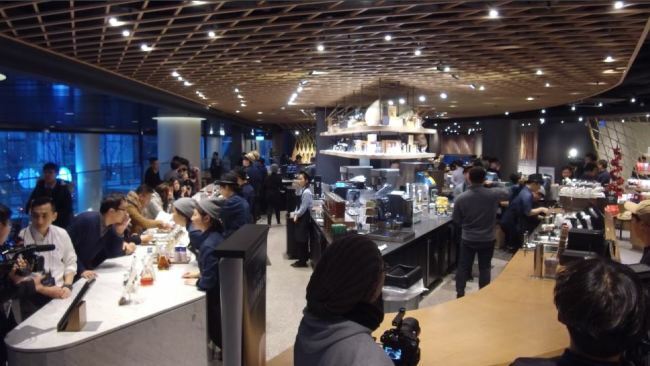 “The store’s interior design takes on the concept of a balance between the global Starbucks brand and the tradition of Korea, in reflection to its whereabouts,” said managing director Kim Hee-kyung in charge of the store’s interior. Customers are faced with a 6.8-meter long artwork at the entrance of the store. The piece, made with traditional Korean fabric, depicts the giant coffee chain’s signature Siren logo, decorated with the Rose of Sharon, the symbolic flower of Korea. According to Kim’s explanation, the large wooden art piece anchored to the ceiling, was inspired from “changhoji and munsal,” traditional Korean door and window structure, while its color is harmonious with the brand’s signature wooden color. A 25-meter triangle-shaped bar is situated at the center of the cavernous space, fully equipped with flashy machines used to serve high-end coffee. “This is the only store in Korea that can serve Teavana beverages using the Siphon, an appliance that uses pressure difference,” barista Hoya with a black apron, said. At the shop, 80 percent of the baristas wear the black apron, the symbol of extra training and competence, a much higher percentage compared to other stores. Around 60 menu items are served at the store. Lee Eun-jeong, the chief of the Category Food section explained that 10 percent of them are prepared exclusively for the branch. “Considering that there are many students and employees in the area, we wanted to provide a proper meal for them,” Lee said, introducing the meal menus, featured by premium natural food brand Organica, a business unit of Herald Corp. 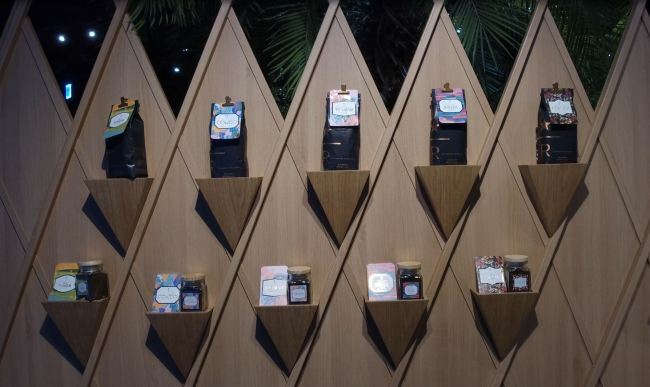 Furthermore, customers can exclusively meet seven types of rice food products, cultivated in Korea, using Starbucks coffee grounds as a fertilizer, packaged with traditional Korean fabric. At the store’s community room, visitors can go through an exclusive trial program of coffee and tea, led by trained baristas, through reservation. After the 20-minute seminar, the separate space can be used individually for up to three hours.